The Seeing Green catalog is now available for purchase through Just Seeds! 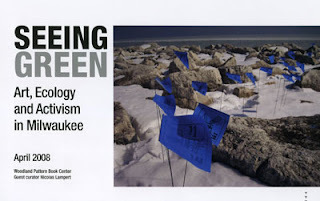 The Seeing Green exhibition catalog features images and text of 30 projects from an activist art show in Milwaukee in April 2008 that was curated by Nicolas Lampert. The show addressed issues of urban environmental sustainability where local artists created various projects including public interventions, street art, posters, books, films, and architecture. Familiar names in the show include Colin Matthes (Justseeds), Sue Simensky Bietila (Drawing Resistance/World War 3 Illustrated), and Brandon Bauer (SAW). This catalog is sure to inspire and exemplifies what artists can do to take a lead an envisioning a greener city.